Align is a brand of food supplements produced by Procter & Gamble. It is commonly referred to as Align Probiotic food supplement. 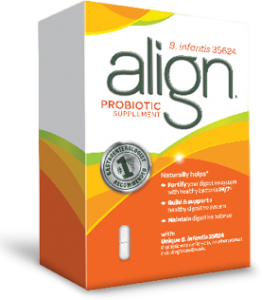 Align contains patented probiotic bacteria and it is a daily dietary supplement. Align has been known to improve the digestive system and helps to improve the overall digestive health of an individual. The researchers at P&G discovered that more than 30 million people in the United States suffered from irritable bowel condition. This was a big problem for a long time in the country, yet there had been no solutions developed to help curb this condition. P&G embarked on solving this problem by developing a daily probiotic pill that would help eliminate the symptoms of this problem. The team encountered a number of challenges in the process of coming up with the solution. The biggest being the cost of coming up with a new brand and whether the business model would be sufficient to support this new product. The researchers however, persisted and eventually came up with the solution that has grown today to be the best probiotic supplement in the world. After the first batches of products were sold mostly online through established websites such as Walgreens.com, the company was later on able to launch the product nationally after the success of the product in the online platform. Align has since been able to win a number of awards. In 2010, Align won the Gold Edison Award as the best new product of the year. The brand also won the best gastroenterologist recommended probiotic brand. Most of the consumers who have tried Align have admitted that their lives have changed for the better.